Ever since that math class, I fell in love with quotes. Over the years I noted down quotes that inspired me and caught my attention. Recently, I reviewed them and decided to curate them into a nice collection I can share. It feels kind of like building playlists from music you collected over time. As I reviewed my quotes, I found a few common threads among them. One of them was a group of words that inspires us start, to take action, and move forward and toward the goal. Everybody can be great, because everybody can serve. You don't have to have a college degree to serve. You don't have to make your subject and your verb agree to serve. You don't have to know about Plato and Aristotle to serve. You don't have to know Einstein's theory of relativity to serve. You don't have to know the second theory of thermodynamics in physics to serve. You only need a heart full of grace, a soul generated by love. And you can be that servant. 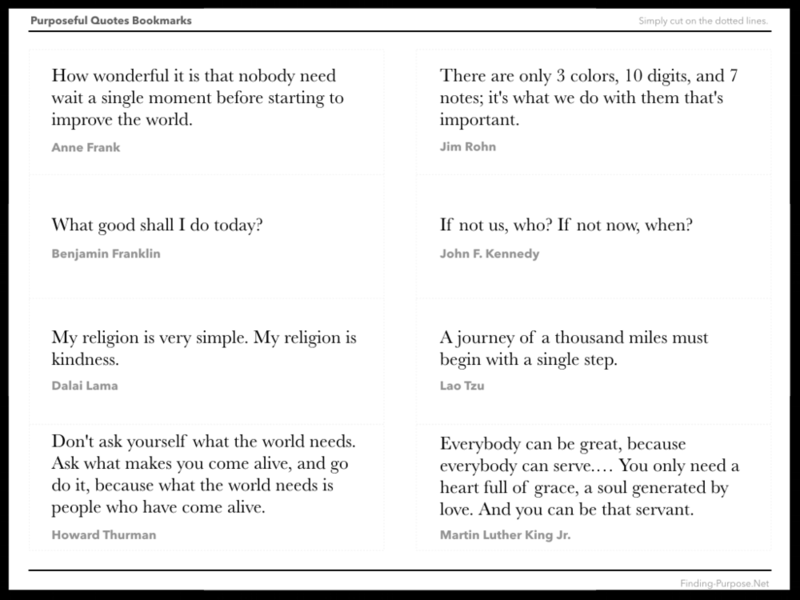 - Martin Luther King Jr.
Once I bought a magazine that came with bookmarks with quotes on them. To this day I still use them. It’s such a great idea, so I’ve decided to made the quote I collected above into bookmarks to share with you. You can find them here at this link. Print on thick paper, cut, and, voila, you have nice bookmarks.